Even Chelsea fans will accept Eden Hazard is flirting with Real Madrid. The Belgium international is making no secret of his desire to play for the Spanish club, and it feels like he’s upped his efforts in recent weeks. Chelsea fans will largely be calm about the situation because Hazard is performing on the pitch and has likely given enough to the club that if Madrid is his dream, and he moves for a great deal of money, then there won’t be too many hard feelings. 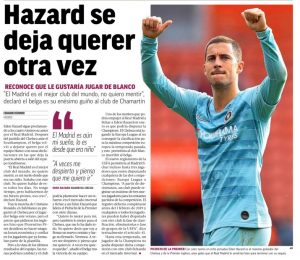 Hazard’s comments have of course caught the eye of Marca, who have him on their Tuesday front page. But it’s not a huge story inside, pushed back to page 6. It’s claimed Real Madrid called those in charge at Stamford Bridge over the summer and asked about a deal for Hazard. 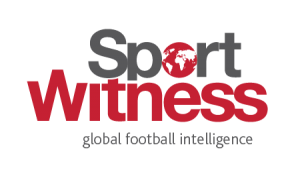 Cristiano Ronaldo was leaving, and Hazard seen as a possible replacement. However, the price asked (not mentioned by Marca today) was too high and Real Madrid president Florentino Perez wasn’t prepared for a transfer which would mean ‘economic madness’. Maybe he regrets that now, Eden probably hopes so.